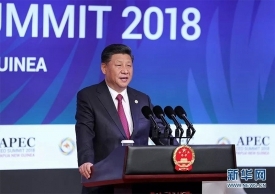 After listening to President Xi Jinping's keynote speech, Cui Genliang said that the speech is of great significance and we are positive in the world economic development and promoting healthy and stable development of Asia-Pacific and even the world cooperation. HENGTONG GROUP would continuously strengthen innovation, enhance core competitiveness, actively integrate into global development, and contribute to the construction of global information and energy interconnection. In addition, Cui Genliang attended the Theme Breakfast and made a speech. During the meeting, Cui Genliang talked with entrepreneurs from world-class companies such as Cargill, Caterpillar, Moody's, Deloitte, Johnson & Johnson, FedEx on "what is the role of the industry and commerce". He also made in-depth exchanges on how to promote the healthy development of economic and trade relations between the two countries, and put forward relevant suggestions. According to the Global Times report, during the summit period, products from China and Chinese brands are everywhere in Papua New Guinea. Chinese enterprises actively participated in local construction. As a representative going out along the "one belt and one road", HENGTONG has also actively participated in the construction of the local communication infrastructure, contributing to improving the local people's livelihood and promoting local economic and social development. The Global Times reported that " HENGTONG GROUP's construction of S2 cable system will provide reliable communication guarantee for APEC meetings, and will greatly improve the communication situation to meet the domestic bandwidth demand for at least 10 years in the future." Cui Genliang received an exclusive interview with the China Global Television (CGTV), through which he introduced the business development of HENGTONG in the Asia-Pacific region and the Papua New Guinea National Communication Project undertaken by HENGTONG. In November 2017, HENGTONG undertook the Papua New Guinea National Communications Project over 5,000 km, which currently is in the stage of being delivered and laid. The project will connect the 14 most densely populated cities and will cover more than 55% of the population in Papua New Guinea after completion, and meet the broadband needs in next ten years for the local. Facing the future, HENGTONG will carry out the mutual-beneficial cooperation with global partners in the fields of information and energy interconnection with the concept of open, inclusive, cooperative and win-win development, and contribute to the world’s better future with Chinese wisdom.